Sit cross-legged with spine straight. Keep the chest slightly lifted so the neck lock is applied. Raise both hands to shoulder level with the elbows relaxed down by the sides. Make fists of the hands. Extend the index finger straight up. The thumb locks over the other fingers. The eyes are looking past the tip of the nose. Chant the Ik Acharee Chand shabad from Guru Gobind Singh’s Jaap Sahib. Chant each word distinctly and pull the navel point in rhythm with the words. Without a master. Destroyer of all. Beyond birth & death. Beyond silence. More than love itself. Beyond all colors. 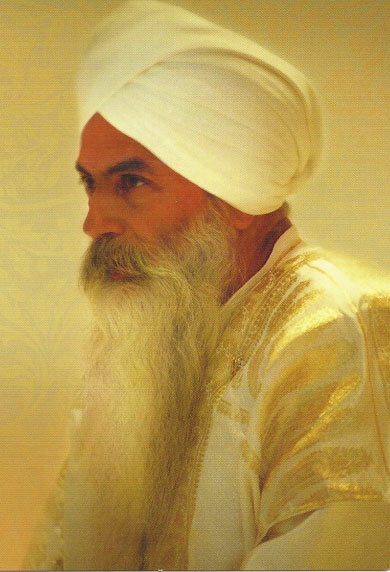 Comments by Gurucharan Singh: As you chant this beautiful mantra, project an attitude. You are vibrating and speaking to the real you. Wake up! Elevate your spirit. Simultaneously hear the sounds coming from everywhere. This mantra is anahat- boundless. The sound already vibrates throughout creation. It flows through you; uses your tongue; speaks your heart. Hear it as the whisper of your soul. Let it awaken your consciousness. Expand your mind with less boundary and ego. Let each word chisel you and reveal your divinity, dignity and depth. Feel you are shining everywhere, as you did in the last stage meditation. This time feel the radiance is already everywhere. You are sensing it not projecting. The light arises from the space of the “unstruck sound” which is everywhere. Chant steadily for 50 minutes. Continue chanting in the same posture but begin to move your torso in circles from the base of the spine in rhythm with the chant. As you chant move with a sense of ease like a tree swaying in gentle breezes. 3 Minutes. To End; Take a deep inhale, straighten the spine and suspend the breath into stillness and grasp the hands of your neighbors on each side. Exhale and immediately move to the next exercise. Holding the hands of your partners on each side, forming lines, move your spine around from the base (without bending). Continue to chant the mantra for 2 minutes; strongly whisper the mantra for 1 more minute. Move immediately to the next exercise. Keep holding hands with your partners. Sit absolutely still. Close the eyes and focus at the brow point. Begin long, deep, steady, slow breathing through the nostrils. Continue listening to the mantra. Establish a mental attitude of the Buddha. Be in perfect balance and feel your presence everywhere like a calm perfect sea. In your radiance you sit with truth, with reality, with the presence of your unlimited Being. 6 Minutes. Then continue the breathing and tighten the grip with your partners. Open your sensitivity to feel the flow of energy that is part of the tidal presence of your infinite self, psyche and God. Sense the energy flowing through you and existing in all places in all directions at once. 3 Minutes. To end: Inhale deeply, suspend the breath, and project yourself everywhere. Exhale. Repeat two more times. Then relax. Sit straight in a cross-legged meditation posture facing a partner. Relax the elbows down and bring the hands facing forward toward your partner’s hands. Do not touch your partner’s hands. Keep the palms separated by about 2- 6 inches (5-15 cm.). Move the hands up and down steadily in rhythm with the Ik Acharee Chand Mantra mantra, matching your partner’s movements. Continue chanting the mantra as you mirror each other, pacing the hands as you sense the energy between them. The hands move about 12 inches (31 cm.) up and down. Fix your eyes unblinking toward your partner’s eyes. Penetrate through the eyes to the light of the soul. See the unlimited space of that person and see them exactly as they are, with you, joined in this common space of energy and awareness. To end: Inhale deeply; suspend the breath and the hand movement. Hold the hands near heart center level between you and your partner. Keep the eyes locked with your partner. Exhale. Repeat two more times. Then inhale with the eyes closed and bring the hands down. Exhale. Move immediately into the next exercise. Continue facing your partner. Extend your arms and bring your palms over your partner’s ears. Press the Jupiter mound, the base of the index finger, against the ear. Seal the ears with tight, but not uncomfortable, pressure. You may have to lean slightly forward to establish the lock. Fix your eyes, looking into your partner’s eyes, without blinking; this is a traatik. Chant the Ik Acharee Chand Mantra loud and clear. Use the navel point in the sound. 9 Minutes. During the final minute increase the pressure of the lock over the ears. To End: Inhale deeply, suspend the breath, look straight, exhale. Repeat two more times with the eyes closed. Then relax. Comments by Gurucharan Singh: This exercise is the polarity of Part 2. You are doing the chant in the nirgun mode of anahat. You are hearing the sound inside as you block the ears. Inside the inner sound is the subtle pulse of the naad. When the body is in balance, its pranas organize into a meditative sensitivity, then these sounds polish your radiant body which is everywhere. The sounds created by the tenth master, Guru Gobind Singh, capture the energy that brings steady success and a shine to your radiant body. The tongue makes the sound in the earthy language of humans and the ears hear it for the angelic part of you to rise through the heavens with joy and ecstasy. This meditation will help give you guidance to guide those who will be struck by the overwhelming levels of change that beset us in this change of age. Radiance everywhere is your capacity to uplift those who are shivering and shattered to be spirited, secure, self radiant and successful to express their destiny in every condition.